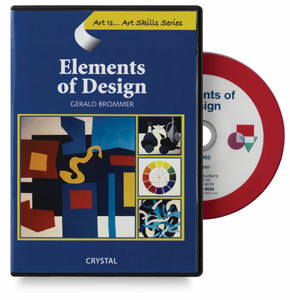 These DVDs from Crystal Productions "Art Is" video series include demonstrations using a variety of drawing techniques and media to help viewers develop their skills. Principles of Design — In this video, Gerald Brommer shows how the elements of design are used and combined in developing the seven principles of design — contrast, rhythm, unity, emphasis, pattern, movement, and balance. A series of demonstrations are combined with diagrams, artwork, and scenes from nature. 29 minutes. 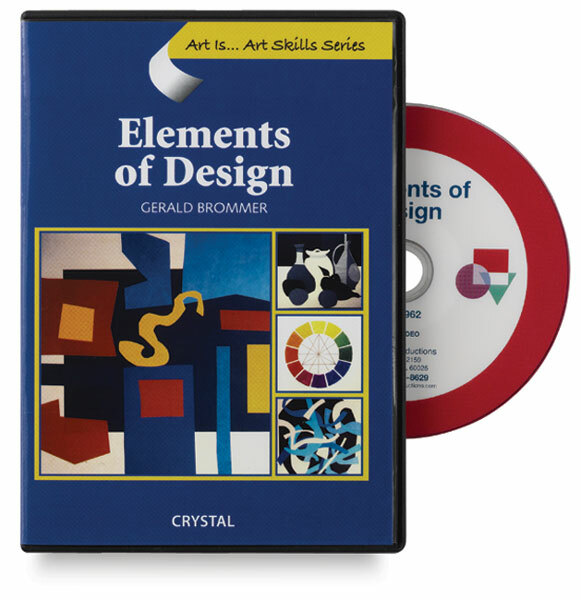 Elements of Design — The seven elements of design — value, color, form, shape, line, space, and texture — are each explored and clearly explained with diagrams and hands‑on demonstrations, including paintings, collages, and sculpture by Gerald Brommer in this video. Examples of elements seen in nature, architecture, and art reinforce the concepts. 30 minutes.